There are 18 Assisted Living Facilities in the Irmo area, with 2 in Irmo and 16 nearby. The average cost of assisted living in Irmo is $3,540 per month. This is higher than the national median of $3,346. Cheaper nearby regions include Lexington with an average starting cost of $2,508. To help you with your search, browse the 137 reviews below for assisted living facilities in Irmo. On average, consumers rate assisted living in Irmo 4.5 out of 5 stars. Caring.com has helped thousands of families find high-quality senior care. To speak with one of our Family Advisors about assisted living options and costs in Irmo, call (855) 863-8283. Irmo, South Carolina, is listed as one of the best places to retire in the Columbia area. It has also been noted as one of the safest cities in South Carolina and one of the most affordable places to live in the country. Seniors retiring in Irmo will find plenty of options, with 19 assisted living facilities close by, including one within the city limits. These facilities are regulated by the Board of Health and Environmental Control and provide room and board and a degree of personal care. The Irmo area has few facilities from which to choose in the event of a medical emergency or illness, with the nearest major hospital located in Columbia. Irmo has an array of community resources for seniors, including the Central Midlands Area Agency on Aging, an organization that provides low- or no-cost services to seniors, as well as one senior center. For transportation for errands, medical appointments and daily outings, the Senior Express offer rides at discount fares throughout the area on a regular or as-needed basis. The overall crime rate in Irmo is 38 percent higher than the national average, which is a concern for seniors. In Irmo, seniors have a one in 26 chance of becoming a victim of any type of crime. Seniors on a budget may find it easier to live in Irmo due to the cost of living of 96.4. This is lower than the national average of 100 and slightly lower than the state average of 94. Seniors who are sensitive to the cold may find it more comfortable living in Irmo. Summers are long and hot, with highs around 92. Winters are short and cold, with lows around 33. The city only gets about an inch of snow per year. Assisted Living costs in Irmo start around $3,540 per month on average, while the nationwide average cost of assisted living is $4,000 per month, according to the latest figures from Genworth’s Cost of Care Survey. It’s important to note that assisted living rates in Irmo and the surrounding suburbs can vary widely based on factors such as location, the level of care needed, apartment size and the types of amenities offered at each community. 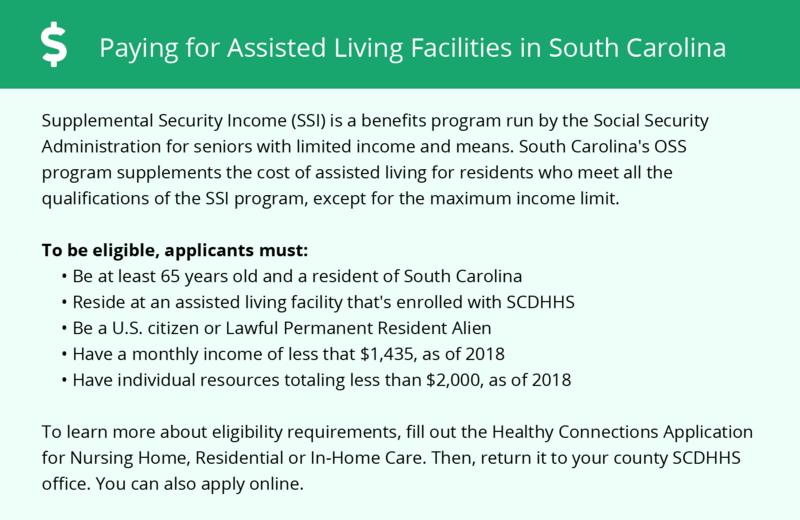 The South Carolina Medicaid State Plan provides assistance to eligible seniors to pay for an assisted living facility. 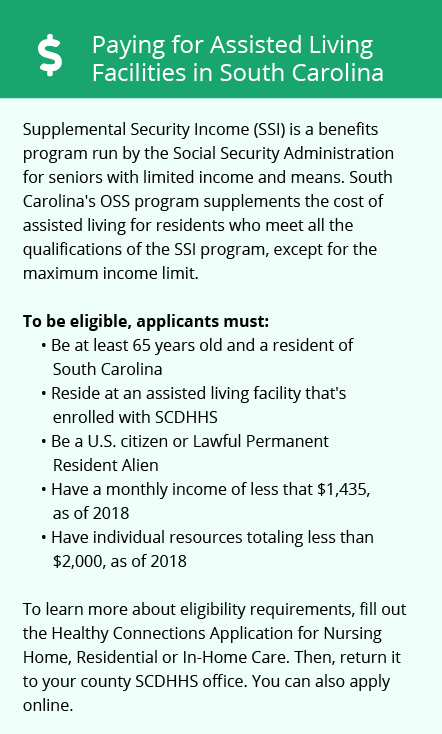 In order to receive help, seniors should meet all Medicaid program criteria and should already be receiving the Optional State Supplement (OSS) to the federal Supplemental Security Income payment (SSI). Family supplementation is not allowed to pay for a private room. Irmo and the surrounding area are home to numerous government agencies and non-profit organizations offering help for seniors searching for or currently residing in an assisted living community. These organizations can also provide assistance in a number of other eldercare services such as geriatric care management, elder law advice, estate planning, finding home care and health and wellness programs. To see a list of free assisted living resources in Irmo, please visit our Assisted Living in South Carolina page. Irmo-area assisted living communities must adhere to the comprehensive set of state laws and regulations that all assisted living communities in South Carolina are required to follow. Visit our Assisted Living in South Carolina page for more information about these laws.